State Sen. Andrew Rice (D-Oklahoma City), pictured right, will liveblog on Daily Kos at 3 p.m., Thursday Dec. 13. Here is the link. Rice, a progressive Democrat, is running against U.S. Sen. Jim Inhofe in the 2008 election. Rice, 34, hopes to upset the 73-year-old Senator who has become a symbol of everything that is wrong about Washington politics today. Inhofe continues to embarrass the state with his personal war on science. His political stunts, which only serve the interests of the big oil companies, make the state seem backwards. If the state’s chamber of commerce types really want to improve economic development here, they will get behind Rice’s campaign. It’s time for a change. 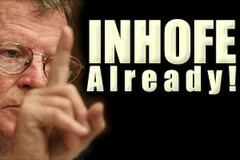 The state needs to send Inhofe into retirement and elect someone as U.S. Senator who is forward thinking and intelligent. Check out Daily Kos here at 3 p.m.
U.S. Sen. Jim Inhofe has brought more embarrassment to Oklahoma. 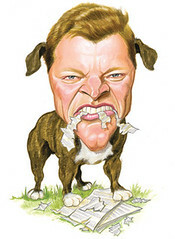 The League of Conservation Voters (LCV) has designated Inhofe as the leader of its “Dirty Dozen” list for possessing one of the worst anti-environmental records in Congress. Unfortunately, the designation ultimately reflects on the state’s residents, many of whom do not support Inhofe’s radical anti-environmental agenda and ideology. This must include some of his fellow Republicans. 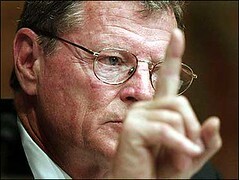 For example, in his ongoing gesture of absurdity, Inhofe calls global warming a “hoax” developed by liberals. He has been admonished by U.S. Sen. Barbara Boxer twice at Senate Environment and Public Works Committee meetings for acting rudely to former Vice President Al Gore and a fellow senator as they tried to speak candidly about climate change. Inhofe not only denies global warming, he also wants to prevent any public discussion about the issue. Inhofe is at odds with the world’s scientific community and President George Bush, who believes humans have contributed to global warming problems. Since 2001, Inhofe has accepted $636, 965 in campaign funds from “polluting energy interests,” according to the LCV. Inhofe responded to LCV’s designation by (what else, of course) trying to demonize the organization as a liberal special interest group, according to his personal public relations firm, The Daily Oklahoman. Meanwhile, former Vice President Al Gore and the United Nation Intergovernmental Panel on Climate Change were awarded the 2007 Nobel Prize for Peace Friday for their work educating the world about global warming. The contrast cannot be greater. Gore, who won the popular vote for president in the 2000 election, wins the Nobel Peace Prize; Inhofe brings more ridicule upon Oklahomans. It is one thing to be a skeptic about the causes and effects of climate change. Honest skepticism helps people get at truth. But it is quite another thing for Inhofe to actively work to suppress basic information about climate change. It should go without saying that the world needs to have a full and open discussion about global warming. Fortunately, State Sen. Andrew Rice (D-Oklahoma City), who is running against Inhofe in 2008, will encourage such a discussion if he is elected. He will not rubber stamp any particular global warming initiative or report without careful scrutiny, but he will allow all sides on the issue to be heard. There are many reasons to support Rice over Inhofe in this race, but this issue alone should be enough for Oklahoma voters to send the 72-year-old Senator into retirement. U.S. Sen. Jim Inhofe, the infamous global warming denier, has turned his legendary right-wing wrath against Oklahoma children. The 72-year-old Inhofe is actively working to stop an appropriate and much needed expansion of a popular children’s health insurance program, the State Children’s Health Insurance Program (SCHIP), even though he represents a state with high rates of uninsured children. Inhofe, echoing President George Bush, calls the expansion a new “entitlement” program for the middle class and even issued a press release about it. The bill would add $35 billion over five years to the $5 billion insurance program and would be funded by raising cigarette taxes. By contrast, the Iraq invasion and ensuing occupation, supported by Inhofe, have already cost close to $500 billion and are not funded by a dedicated revenue source. Bush recently asked for another $200 billion to fund the occupation. This would bring the occupation’s basic costs to $700 billion. Bush has vetoed the bill expanding the insurance program. Both the House and Senate passed the expansion bill by wide majorities. Many Republicans joined with Democrats on the issue. About 70,000 Oklahoma children are now covered under the program. Health officials say another 40,000 might be eligible for the program if Congress rejects the Bush veto. (If the votes remain the same, the Senate can override the veto but the House cannot.) There are over 140,000 uninsured children in the state. U.S. Rep. Dan Boren, the only Democrat in Oklahoma’s Congressional delegation, recently reversed course on the bill, saying he would not support Bush’s veto. Holmes commended Boren for his decision. “It is encouraging that we have one Congressional Representative in Oklahoma who cares about Children’s health,” Holmes said. Inhofe continues to support Bush’s ideological stances despite recent poll numbers that show only 39 percent of Oklahomans approve of the president’s performance. It is simply ludicrous to politicize the expansion of this program. A vast majority of Oklahomans and Americans know our health care system needs reform. If Inhofe and Bush want to test our kids relentlessly under No Child Left Behind, then at the very least they should make sure they have halfway decent health care. What are Inhofe’s ideas about improving health care for all Oklahomans, even those with health insurance? Fortunately, Inhofe is up for re-election in 2008. His opponent, State Sen. Andrew Rice (D-Oklahoma City) worked diligently in a bi-partisan effort last legislative session to get the “All Kids Act” passed, which increases health care cpverage for children.. Rice says wants to improve the ailing health care system for all Oklahomans. In a sign that Oklahomans want a new direction, Rice raised $312,000 in campaign funds the last eight weeks. His campaign grows in momentum. Click here to get involved with or donate to Rice’s quest to send Inhofe into retirement. In another sign that Oklahomans want a new direction, John Edwards leads all presidential candidates here (yes, that includes the Republicans) in a recent poll. Oklahoma’s most embarrassing political leader, U.S. Sen. Jim Inhofe, continues to throw angry fits in committee meetings in an effort to stop discussions over scientific and firsthand information related to global warming. In yet another bizarre episode in the senator’s personal war against science, Inhofe tried to prevent U.S. Sen. Barbara Mikulski (D-Maryland) from discussing the impact of global warming on the Chesapeake Bay. Mikulski and other Bay area politicians were invited to share information at a recent hearing of the Environment and Public Works Committee, headed by Sen. Barbara Boxer (D-California). According to Ryan Grim at Politico, Inhofe objected to allowing Mikulski talk about her recent trip to Greenland’s melting ice sheet, global warming and the effect of climate change on the Chesapeake Bay. He argued there was no precedent for Mikulski to talk and that he would agree with it only if Boxer would promise it was a one-time deviation. As she did when Inhofe rudely confronted former Vice President Al Gore at a meeting, Boxer had to step up and defend basic commonsense and basic integrity when the 72-year-old Oklahoma politician acted out. Grim writes Inhofe became red faced. The larger tragedy here beyond Inhofe’s embarrassing, sophomoric behavior is how Oklahoma’s senior senator continues to do anything he can to prevent serious discussions about global warming. It is one thing to be a skeptic about the effects of global warming and say so. It is Inhofe’s right to be wrong on one of the most important issues in the world today. But it is simply crazy and dangerous to work actively to suppress information so the public remains unaware of the issue. If global warming does not exist, then any information supporting its reality should be easily challenged, right? Inhofe’s recent actions bring up the question of whether he possesses the mental stability to serve his country in such a powerful leadership role. A U.S. Senator owes it to all the American people and constituents to allow a full discussion on important issues. A U.S. Senator also owes constituents mature, reasonable behavior. Fortunately, State Sen. Andrew Rice (D-Oklahoma), a true progressive, is running against Inhofe in the 2008 election. Rice will not rubber stamp any particular argument without careful and considered scrutiny, but he will always allow a full discussion about important issues facing Americans. U.S. Sen. Jim Inhofe, the Washington relic and Bush lapdog, is holding his annual Oklahoma Dove Hunt at Quartz Mountain Lodge Sept. 7-8. His invited guest is probably the only other senator who will even be seen with him these days, John Cornyn (R- Texas), another Bush toady and Washington insider. Are there two more washed-up, narcissistic Washington politicians than Inhofe and Cornyn? And here these two Republican bigwigs are hunting the dove, the international symbol of peace, as more American soldiers and innocent Iraqis die. The hunt is a dark but fitting symbol of the killing these two men have supported during the Iraq occupation. As many Republican leaders, such as U.S. Sens. John Warner (Virgina) and Chuck Hagel (Nebraska) moderate their positions on the occupation, both Inhofe and Cornyn want the killing to continue indefinitely. Inhofe has also embarrassed Oklahoma and the nation with his outrageous comments about torture, global warming and lifestyles. He is despised throughout the world as an ultra-partisan who does not believe in basic scientific evidence. State Sen. Andrew Rice (D-Oklahoma City), a progressive Democrat, is running against Inhofe in the 2008 election. Rice believes Inhofe took his “eye off the ball” by not going after terrorists after the September 11, 2001 terrorists attack. Rice’s bother, David, died in the World Trade Center attacks on that day. Instead of hunting terrorists, Inhofe blindly followed Bush into the Iraq debacle and now the country is on the wrong track. But while Inhofe is hunting dove as more American soldiers and innocent Iraqis die, we can help send him into retirement. I have started a Hunt Terrorists, Not Doves account for Rice on ActBlue. Become a Rice Dove by contributing to his campaign to fight the well-funded Inhofe. As Inhofe shoots it up with Cornyn in Oklahoma, we can be working to end his reign of incompetence in Washington. We wanted to post this quickly. This post on New Nebraska Network is a must read. Check it out and click through the links. U.S. Sen. Tom Coburn and his supporters prove their hypocrisy again.